One of the more common gripes I often hear about Metro isn't directly related to Metro. Rather, it's a complaint about other Metro customers and their sometimes annoying or — let's face it — odd behavior. Of course, it's hardly a complaint unique to Metro. Take, for example, Paris. As this great post in the Atlantic Cities notes, a recent survey of passengers on the Paris Metro reported seeing behavior that was either in direction violation of transit rules or was, at the best, unseemly and/or rude. So the folks who run the Paris system have come up with an ad campaign that uses posters to urge their customers not to act like animals. Seriously. 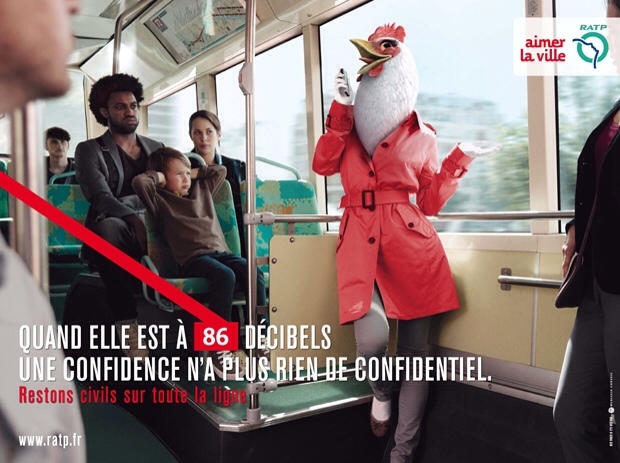 The above poster caption translates to “when it's at 86 decibels, it's no longer a secret.” In other words, don't squawk like a chicken. The rest of the posters are in the Atlantic Cities post. Funny thing is that none of them deal with what I consider the most annoying behavior — the dreaded loud music from MP3 players, sometimes with headphones, sometimes not. If you're curious about the L.A. Metro's code of conduct, here it is. Happy reading! Tokyo Metro has by far the best “manners” posters over the years.. I have ridden many transit systems in America including LA’s Metro and when you compare passenger behavior to that in places like Japan, it’s night and day. Talking on a cell phone on board a train in Japan is unheard of. You can text, visit websites, listen to music, etc. However, you are expected to turn your phone off if you are sitting near the priority seats (elderly/disabled) as the radiation from cellphones may cause issues with pacemakers. But unlike LA, Japan still provides paper tickets to those who do not have Suica/Passmo (TAP) cards. And when the Suica/ Pasmo became available…. wow, what a difference! No more looking at transit fare maps to figure out the *distance-based* fare, the computer does it for you. Also, I wonder if cultural differences make more of a difference than clever posters? I’d love to see more Americans read manga quietly on the subway, but how do you import that?